We know, we know, you want a lake to yourself and don't really wanna share a huge campground with hundreds of other folks. Picking a decent campground online is difficult enough - with the numerous managing agencies, confusing park names, long driving times, freeway routes and hefty reservation fees. Avoid reservations all together and discover travel off the beaten path. Mid week campground stays can be better than weekends, but during summertime all week long is peak season w/ maximum visitors circulating. Neighbors at camp can often mean annoyances - children, generator noise, vehicle engines, boating trailers, music and partying. Quiet time is usually 10pm to 7am, but that doesn't mean the loud garbage truck won't wake you at 6:50am. Big campgrounds are developed parks with more than 20 camp sites, usually found along paved roads and highways. Level tent spots, paved stalls, piped water, bathrooms, RV hookups (maybe). City campgrounds, private camping resorts, large lake campgrounds, and RV parks fall into this category. The larger the campground, the busier the scene and the higher the noise level. Smaller campgrounds are those with less than 20 sites. We tend to feature small campgrounds on Total Escape, so you can enjoy more nature and less people. Real photos of real places that we've actually visited. Authentic, sacred spaces, original content and maps to go with. No canned camp descriptions, no RV park advertisements, no lifetime membership campgrounds. Popular destinations like State Parks & Beaches, National Parks and recreational lakes tend to pull in serious tourists crowds throughout California, all year long. However camp diva DanaMite likes to focus on lesser known camping options, specifically for your viewing pleasure. Camp dirt cheap or free outside the National Park boundary, in the neighboring National Forest lands. You may need to drive an hour for the sightseeing stuff (located away from camp), but at least the overnights will be perfectly pleasant and peaceful, just like nature is supposed to be! Autumn in Rock Creek Canyon, Eastern Sierra. Camp outside campgrounds: also referred to as primitive camping, dispersed car camping, free camping, boondocking, remote camps and open camping. Back roads and dirt roads offer more seclusion than typical campground camping, but you'll need to rough it. Self sufficient campers are able to enjoy themselves with private creekside spots - free camp sites, located well away from the crowds. No picnic tables, no toilets, no camp host, no fees. Bring the shovel and campfire permit. Call the rangers and ask questions. Know current fires restrictions in the area you plan to camp, cuz you're responsible for your own fire, and making sure it doesn't become a wildfire. Always water down your camp fire well before you leave camp! then camping on dirt roads is best for you! Seldom will motorhomes venture down unpaved routes, deep into the woods, so these prime camp sites are for those seeking true peace and quiet. Seasonal creeks, small clearings, forest spots, very scenic, very remote, very private. PAVEMENT is minimal, if any. You'll be lucky to see another person out in the boonies. At the end of dirt roads, a turn around point, a dirt parking area, a nearby picnic spot, a fishing hole, a waterfall perhaps, usually trailhead parking; many routes dead end at totally secluded campsites. Many are accessible by passenger cars. Some will require 4x4 to reach; some only require a high clearance vehicle; 2WD trucks can find hidden camp sites better than a typical car. SUV & AWD sport wagons are adequate for dirt road driving and seeking dispersed camping. Arrive and explore new areas in daylight hours for best results. GPS your favorite campsite and nearby ones, so you can arrive (in the dark next time) without any hassles. Make sure you have the bare bone basics! Always carry printed maps when traveling, so you can cross reference directions, paved roads and dirt roads, creeks, terrain, and know alternate routes (in case you come across a landslide or downed tree across the road). Arrive at the wilderness trailhead before dark with your trusty waterproof topographic trail map, which will have all the dirt roads, paved roads and hiking trails. Do not trust online maps as your primary map source; It is perfect for overview and planning. Mobile devices will not give you accurate detailed maps or street names for back country wilderness travel, trailheads, dirt roads or special little, one lane, paved routes. Digital cybermapping might be able to get you to the nearest small town post office, but you shouldn't trust them with topographic details, hiking trails or primitive camping on back roads. California has some amazing scenery, small towns to big cities and what better way to enjoy it then by bike. 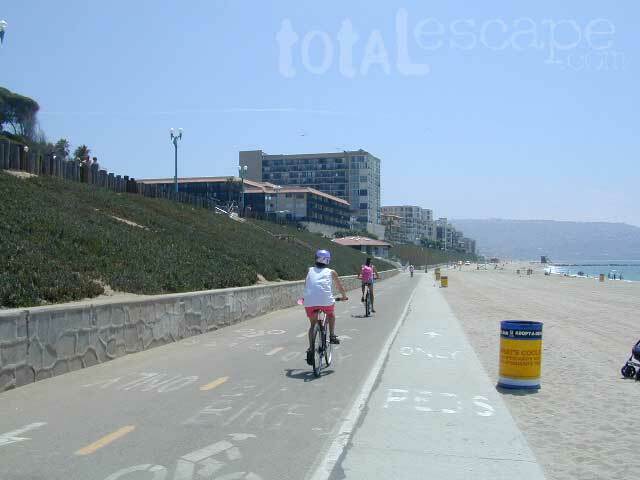 Numerous bike paths, a couple of miles of beach or a full day cycling journey. Paved, level, leisurely bicycle routes near marinas, beaches, city bays, connecting villages small towns, redwood forest, some in the country, some along rivers and several within National Parks! Town links listed below will lead to several prime biking destinations where you can browse bike routes, hiking trails, museums, parks, campgrounds, cafes, coffee shops, restaurants, farmers markets, lodging, bike rentals and surf shops.